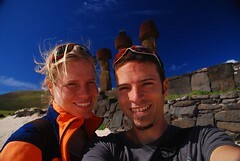 So we went to this incredibly isolated, but oh so beautiful place called “Easter Island”. Although it belongs officially to Chile since 1888, it breathes the temperament and history of its Polynesian ancestors. 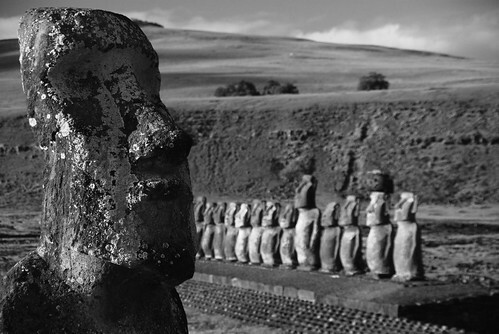 Because that is one thing for sure: the Rapa Nui (the inhabitants of Easter Island) came from Polynesia. Vera: Pfff… Personally I think they are all wrong. I think at some point, the Easter Island got taken over by some alien force, planting secret seeds from which the Moai sprouted. Jean-Christophe (JC): Not at all, they could be carried. Vera: What do you mean, like by a bird? A swallow carrying a Moai? JC: It could grip it by the ears! Vera: It’s not a question of where he grips it! It’s a simple question of weight ratios! A five ounce bird could not carry a 10 tonnes Moai! Vera: …it could be carried by an African swallow! JC: Oh, yeah, an African swallow maybe, but not a European swallow, that’s my point. JC: But then of course African swallows are not migratory. Vera: Wait a minute — supposing two swallows carried it together? JC: No, they’d have to have it on a line. Vera: Well, simple! They’d just use a standard creeper! JC: What, held under the dorsal guiding feathers? This entry was written by Vera and posted on June 27, 2008 at 4:12 and filed under Easter Island, World Trip. Bookmark the permalink. Follow any comments here with the RSS feed for this post. Both comments and trackbacks are currently closed. dat vind ik ook altijd boeiend, je bezig houden op welke manier het kunstwerk tot stand is gekomen…blijft gissen maar leuk om te brainstormen. Blij te lezen dat jullie NZ als indrukwekkend hebben ervaren, als ik terug kijk op mijn verblijf /vakantie aldaar 26 jaar geleden , heb ik dat gevoel nog steeds..jullie zien er nog steeds stralend uit en dat is niet alleen aan de buitenkant…wat een ervaringen hebben jullie opgedaan, onvergetelijk!! Do very small Moais also float in water? And will you pass by the capital of Assyria? ..by the way, what is the capital of Assyria?